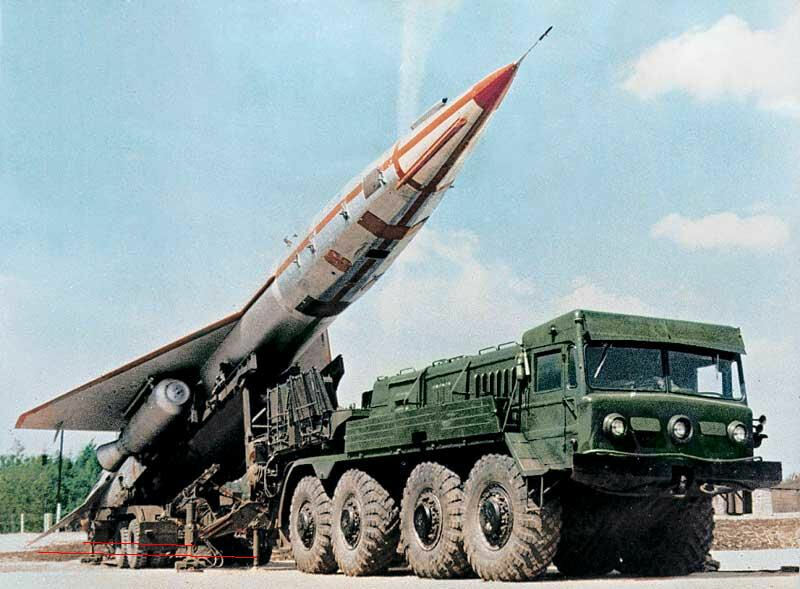 In the later half of the 1950s, both the US and the USSR worked on long-range cruise missiles for nuclear attack. Neither side actually fielded any of the big cruise missiles developed in this era, but the Soviets did put a reconnaissance drone based on one into service. 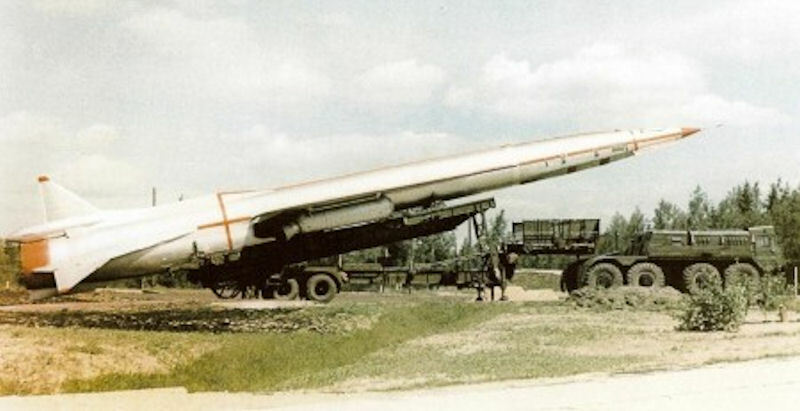 The Lavochkin OKB worked on a transcontinental-range cruise missile named the "Burya (Storm)", while the Myasishschev OKB worked on a similar concept named the "Buran (Blizzard)", neither of which reached operational status. The first step in the work in the field of rocket engineering OKB-156 by AN Tupolev was made after the release of the proposal to create a three-stage liquid rocket with a starting mass of up to 240 tons. The missile was intended to bring out to a height of 50 km and accelerate to a speed of 20,000 km / h of a planning unmanned impact vehicle. According to calculations, the device, when planning a flight, was supposed to deliver the warhead to the target at a range of 9,000-12,000 km with a miss of no more than 10 km. 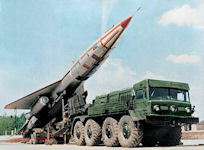 The unmanned vehicle, when approaching the target at an altitude of 30 km, should have a speed of about 7000 km / h. By the decision of the Council of Ministers of the USSR of March 19, 1957, OKB-156 asked only to study the prospective "planning cruise missile" within the framework of the research work "KR" (later the research work "DP"). The experimental design work carried out at the end of 1958 made it possible to issue, at the end of 1958, a preliminary design of the intercontinental airplane - projectile D - an unmanned 123 airplane with an NK-6 engine, which provided the delivery of a combat load (thermonuclear warhead) to a range of 9000-9500 km with accuracy up to 10 km. The D-bomb was to fly at altitudes of 22-25 km at a speed of 2500-2700 km / h.
In the years 1958-1960. OKB-156, in parallel with the work on the Tu-121 projectile, began work on the intercontinental long-range Tu-123 missile. The Tu-123 project was a competing version of the Tu-121 variant, enlarged in weight and dimensions. To achieve increased flight range in the new project, it was planned to increase the fuel supply and install a new, non-sparse, more economical, turbo-ventilated solid fuel engine NK-6 with a maximum thrust of 18-22 tons. The combat part was increased by the use of a powerful thermonuclear charge. The control system of the Tu-123 was supposed to be performed by an astronertial one. For the same reasons as for "product 121", the work on this project, without leaving the stage of preliminary design, was soon discontinued. Subsequently, the code "123" was assigned to the unmanned scout of the Yastreb complex. Works on large-range unmanned strike aircraft which started in 1958 were stopped in 1960, defining a basis for activities on unmanned reconnaissance aircraft "Yastreb"-DBR-1. The Tupolev OKB worked in parallel on a shorter-ranged ground-launched cruise missile with the OKB designation of "Tu-121". Design began in 1957, with initial prototype flights in 1959. The Tu-121 program was cancelled in favor of intermediate-range ballistic missiles (IRBMs) in 1960, but within a few months it was resurrected as a long-range Mach 2+ reconnaissance drone, the "Tu-123 Yastreb (Hawk)". 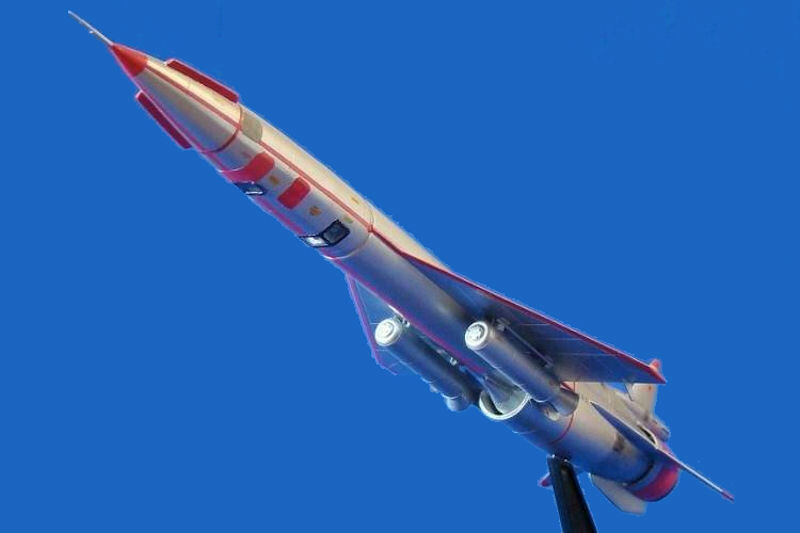 In 1964 a long-range supersonic unmanned reconnaissance aircraft TU-123 "Yastreb" were adopted which became a firstling of Tupolev family of unmanned reconnaissance complexes. From 1965 DBR-1 complex entered serial production. The aircraft had unique characteristics for that time. It was completely autonomous for combat missions and data acquisition and processing. The main purpose of the Tu-123 was to conduct photo and electronic reconnaissance in the depth of the enemy's defense at a range of up to 3000 km. When launched from positions in the border areas of the Soviet Union or deployed in the Warsaw Pact countries, the Hawks could perform reconnaissance raids almost over the entire territory of central and western Europe. This unmanned vehicle with a maximum take-off weight of 35610 kg had on board 16600 kg of aviation kerosene, which provided a practical range of flight 3560-3680 km. The altitude of the flight along the route as fuel was produced increased from 19,000 to 22,400 m, which was more than the well-known American reconnaissance aircraft Lockheed U-2. The speed of the flight on the route is 2300-2700 km / h.
In the late 1950s due to the increasing risk of a possible nuclear strike by the United States, the Soviet Union made the decision to develop a system of remote cameras and unmanned signals intelligence, which won the title of "Hawk". Responsible for fixing the puzzles were appointed Tupolev, which has already had experience in developing unmanned attack aircraft projectile Tu-121. Soon bureau was created by the supersonic distant drone spy (UAV), designated Tu-123 "Hawk", other coding machine was DRB-1 — Long-range Unmanned Scout # 1. Its main purpose was to conduct photographic and signals intelligence at ranges of more than 3000 km. Creation by Tupolev of the Tu-121 and Tu-123 "Hawk" in the Soviet Union laid the base for aerodynamic calculations taking into account the specificity of the UAV design and production of aircraft equipment, automatic control laws and, above all, control and navigation systems. Were laid release technology in the production and testing of UAVs, their refinement and testing. Research institutes Air Force did a great job and picked the ideology of combat deployment and technical operation of this kind of systems in military units. Remote unmanned reconnaissance system designed for aerial reconnaissance of airfields, missile sites, naval bases and ports, military and industrial facilities, connections ships, missile defense and air defense, and implement control over the fruits of the use of weapons of mass destruction (chemical and nuclear). Photographic reconnaissance was carried out by photographing large areas and long-distance routes and detailed aerial cameras general intelligence. On its own UAV design Tu-123 "Hawk" matched earlier attack aircraft Tu-121, the main difference is the placement of the intelligence apparatus. This equipment, combined with a certain number of parts of navigation and piloting complex was located in the nose of the aircraft a total weight of 2 tons. The part has been returned and landing on the ground with the help of a parachute. The nose of the chassis was equipped with a special lightweight design that is released into the air immediately before landing. 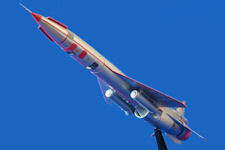 The rest of the design of the Tu-123 followed completion of the intelligence task. During the design, the maximum reserve for the 121 aircraft (Tu-121) was used. At the same time, designers encountered a number of specific problems. It was required to develop a new effective long-focus aerial camera, place onboard the radio-reconnaissance equipment, providing it with normal operating conditions; to develop a new control equipment that provides an autonomous flight along a given trajectory and the unmanned aircraft to the designated area; ensure separation in the air and landing on the ground or water container with reconnaissance equipment, a parachute system to brake the aircraft and save the nose compartment. Electronic reconnaissance was carried out by recording the radio signals of the enemy, who were working in the area of surveillance aircraft. Recorded radio allows finding the source and the type of radio equipment deployed enemy. Tu-123 "Hawk" allowed the creation of: a photographic reconnaissance route or strip area of width of 60-80 km. and up to 2,700 km. a scale of 1 km. It could see also the band width of 40 km. and up to 1400 km with 200 m scale of 1 cm electronic reconnaissance was carried out with the depth of side-scan up to 300 km. Compartments with established photographic reconnaissance did the typical "shop", which was heat-resistant glazing of glass filled with a special system airflow. This system prevents the formation of so-called effect of "haze" in the space between the glass and the camera lens. Above the nozzle motor was placed a container in which the drag chute was used to quench the airspeed before undocking bow compartment with equipment installed in it. The control system "Hawk" worked independently. Terminal scouting of the place of landing with reconnaissance equipment carried by the drive radio. UAV was prepared to fly at the starting position, which included starting a car-tractor STA-30 which was developed on the basis of the missile MAZ-537 with semi — starting the installation, control and start the car CARDS 1. In the back of the CARDS-1 was test equipment. Specifically, prior to starting the control system, "Hawk" was introduced programm flight. UAV Tu-123 was launched from an inclined ramp. Start coming off the machine with the launcher and the acceleration to the required initial velocity produced by the starting solid boosters PRD-52, holding a thrust at 80,000 kgs. each. Both the accelerator stopped working for 5 seconds into the flight, then separated from the fuselage of the UAV. Cruise flight Tu-123 "Hawk" was provided by the engine KR-15-300 which for 9 seconds worked in afterburner with a thrust of 15,000 kg., then came shooting vozduhopoglotitelya manifold and the engine was transferred into cruising mode for maximum traction in 10,000 kgs. In flight, the onboard cameras cut in and off on command. After the job is an unmanned spy plane program unfolded in working direction and at a distance of 400-500 km. going from the base of the drive switch-board equipment. After identification of the aircraft ground-based capture to delivery and tracking of the UAV teams needed for its output at a given point landing rescued compartment with reconnaissance equipment. By going off program residual fuel is drained, then the unit was transferred to the climb to quench speed and braking parachute release occurred. After that the intelligence [razvedoborudovaniem] compartment separated and descended to the ground. Serial production of the Tu-123 UAV "hawk", and other members of the complex was carried out in Voronezh until 1972, previously have been released 52 UAV. Flying Tu-123 "Hawk" in order to maintain the practical abilities of professionals parts of BSR and testing is usually carried out only on a fairly large Russian test ranges (Far East and Trans-Baikal region, Central Asia). The flight routes were laid over sparsely populated regions of the USSR. If, due to failure of onboard equipment drone bowed out of the route with the trend care polygonal, carried out its liquidation: the ground sends a command that disables the engine drone and translated into a dive with deep slope. Outwardly Tu-123 differed little from its parent Tu-121. For Tu-123 was developed a new launcher STA-30 (starting automobile tractor SARD-1). The starting device was created on the chassis of a tractor MA3-537 with a semitrailer. The MA3-537 was equipped with a 525 hp diesel engine. The start took place at an angle of 12 ° to the horizon. According to the program introduced into the equipment before the start, the software mechanisms made the switching on and off of the aerial cameras. After completing the specified flight program and turning for a return flight at a distance of 400-500 km, the onboard equipment of the drive was automatically turned on. Survey ground PLC in the ground-based drive system made detection and identification of the reconnaissance aircraft. After identification, the scout was seized for autosupporting and the automatic system of the drive was turned on, which issued radio commands on board to bring the plane home and to the landing of the instrument compartment in the given place. According to the program, a command was issued to stop the engine, to drain the fuel from the tanks, to translate the flight path of the aircraft to climb to speed out. Then a command was given for the production of the braking (tail) parachute. After that, a command was made to shoot the locks of the bow attachment and the main landing parachute was put into operation, on which the nose part fell to the ground. To shock the impact, when touching the airborne system, four chassis legs Tu-123. The tail part, when lowered on the brake parachute, collapsed when it struck the ground. After the landing of the instrument compartment, the radio beacon began to operate automatically on it, which provided its search by ground search services. System DBR-1 was in service with the Soviet Air Force for intelligence, who were stationed in the western border area of the military, right up to 1979. Apparatus Tu-123 "Hawk", starting with the areas of the USSR, could be successfully conduct reconnaissance of virtually all areas of Western Europe. Operation of the system in the Soviet Union once tested a huge number of polygons starts in the Air Force exercises. But without looking at the real objectives of this exploration of the terrain of the NATO TU-123 "Hawk" was never fulfilled. Whether reconnaissance flights were conducted over the countries of the probable enemy is unknown. In any case, the countries of NATO did not send complaints. The main purpose of the Tu-123 was to conduct photo and electronic reconnaissance in the depth of the enemy's defense at a range of up to 3000 km. When launched from positions in the border areas of the Soviet Union or deployed in the Warsaw Pact countries, the Hawks could perform reconnaissance raids almost over the entire territory of central and western Europe. "Yastreb" reconnaissance aircraft had flight speed of 2700 km/h, flight range - abut 4000 km and flight altitude - 19-22 km. From said altitude it was possible to recognize railway sleepers. It was the real break-through in various trends of aviation science. To perform photo-reconnaissance long-focus aerial camera and radio-reconnaissance station were built for the first time for in-flight record of all data received from military radio-emission sources. Operational standards for unmanned complex, list of required specialists and combatant unit structure were developed for the first time when making "Yastreb" DRB-1 formations and during its operation. All these served later as a basis for further unmanned complexes. "Yastreb" DBR-1 complex operation confirmed aviation need in unmanned complexes. In 1968 three years after entering into combatant unit operation a new Government Decree was issued on building of unmanned complexes of different purpose. The Design Bureau was commissioned with manufacturing tactical complex "Reis" and operation and tactical "Strizh". After adopting a supersonic reconnaissance aircraft MiG-25R in 1972 DBR-1 complexes began to appear evenly with weapons and their components are disposed of. Part of drones Tu-123 was transferred to the Air Force for the creation of test range targets (data UAV simulated South American missiles "Pershing"). At the current time surviving copy of Tu-123 "Hawk" is presented at the exhibition aircraft, located at the Central Airport imeni M.V.Frunze in Moscow. Further, the code "123" was used for the unmanned scout of the Yastreb complex. As a variant of the development of the "121" project and the acquisition of an unmanned aircraft with intercontinental range on its basis, a draft "133" ("SD") - a "121" aircraft with an increased fuel reserve in internal tanks and additional suspended drop tanks was studied. The project was viewed as a simplified alternative to "123" ("D"). Several unrealized projects were developed on the basis of the Tu-123. Among them were the projects of an unmanned target aircraft "123M" (Tu-123-M); shock or reconnaissance versions of "product 123" with a nuclear power plant (solid propellant jet engine with built-in reactor and heat exchanger). This variant did not receive a unique designator, and is entirely un-attested [as of 2018] in the open literature apart from a standard "fact of" sentence. Presumably initial studies were not promising. When designing the Tu-123, it was supposed to use its nose part many times. However, in practice, a new aircraft was prepared for each flight. According to the requirements of the Resolution of the Council of Ministers on the unmanned reconnaissance system "Yastreb" from OKB-156, it was required during the design to consider the creation of a fully recoverable unmanned reconnaissance aircraft. OKB-156 in the early 1960s considered two options for implementing the idea of recovery ["salvation"]. The first option envisaged the creation of manned "product 123". This project received the designation Tu-141 ("123P") or "Yastreb-P". According to preliminary proposals, the reconnaissance aircraft was to be launched as its unmanned prototype, but to carry out the task and return to their territory and make a landing under the pilot's control. This option was rejected as a low-end, cross out one of the main advantages of an unmanned scout - its combat stability under the influence of a wide range of damaging factors and the absence of negative reactions at the psychophysical level inherent in a person.